This area is one of rugged tablelands, cliffs, deep valleys and rivers and lakes. There are many rare and different plants and animals which tell the story of Australia's great age. It shows the story of the evolution of Australia's unique eucalypt trees and the other plants and animals which live among them. The Greater Blue Mountains Area covers about 10,300 square kilometres. It is mainly forest on a sandstone plateau 60 to 180 kilometres inland from central Sydney. The area includes large areas of wilderness and is about one third the size of Belgium, or twice the size of Brunei. The Blue Mountains are a blue color. This is because rising air temperature makes the oil of Eucalypts evaporate into the air. This makes the mountains seem bluish. The Blue Mountains are not really mountains, but a sandstone plateau rising from less than 100 metres above sea level to 1300 metres at the highest point. The plateau is cut through with deep valleys. There are basalt outcrops on the higher ridges. There are many different plants and animals which probably survived because they found shelter from climatic changes during recent geological history. The area is famous for its many different eucalypt habitats, from wet and dry sclerophyll grasslands, mallee heathlands, as well as swamps and wetlands. There are 91 species of eucalypts, 13% of all eucalypts, in the Greater Blue Mountains Area. Of these, 12 only grow here. The area has been described as a natural laboratory for studying the evolution of the eucalypts. This is because there are so many of the different types growing in the Greater Blue Mountains Area. The area shows examples of how the eucalypts have changed to grow in the different Australian environments. These vary from tall forests at the margins or rainforest in the deep valleys, through open forests and woodlands, to shrublands of stunted mallees on the exposed tablelands. As well as the eucalypts, the Greater Blue Mountains Area also contains ancient, relict species of world wide importance. The most famous of these is the recently discovered Wollemi pine. This tree is a "living fossil" dating back to the age of the dinosaurs. Thought to have been extinct for millions of years, the few surviving trees of this ancient species are known only from three small groups located in remote valleys within the area. The Wollemi pine is one of the world's rarest species. Sclerophyll: Very tough leaves and stem; packed with poisons and/or indigestible stuff. Not good food for herbivores, a type of defence against herbivory. In Australia, often dry savannahs, dominated by grasses with an overstorey of Eucalypts and Acacias. Mallee: A type of plant habit. Groups of small trees coming up from an underground lignotuber, a starchy enlarged root (or stem) which stores water. Gives rise to clumps of smallish eucalypts. More than 400 different kinds of animals live within the valleys and tablelands of the Greater Blue Mountains Area. These include threatened or rare species such as the tiger quoll, the koala, the yellow-bellied glider and the long-nosed potoroo. There are also rare reptiles and amphibians including the green and golden bell frog and the Blue Mountain water skink. The largest predator of the area is the dingo. These wild dogs hunt for grey kangaroos and other prey. The Greater Blue Mountains Area has been identified by BirdLife International as an Important Bird Area (IBA). It has many of the world's rockwarblers, as well as flame robins, diamond firetails and pilotbirds. The endangered regent honeyeater is seen there regularly. It is also a migration bottleneck for yellow-faced honeyeaters. The Greater Blue Mountains Area was listed as a World Heritage Area by UNESCO on 29 November 2000. 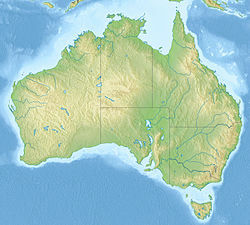 It was the fourth area in New South Wales to be listed. “ "Criteria (ii) and (iv): Australia’s eucalypt vegetation is worthy of recognition as of outstanding universal value, because of its adaptability and evolution in post-Gondwana isolation. The site contains a wide and balanced representation of eucalypt habitats from wet and dry sclerophyll, mallee heathlands, as well as localised swamps, wetlands, and grassland. 90 eucalypti tax (13% of the global total) and representation of all four groups of eucalypts occur. There is also a high level of endemism with 114 endemic taxa found in the area as well as 120 nationally rare and threatened plant tax. The site hosts several evolutionary relic species (Wollemia, Microstrobos, Acrophyllum) which have persisted in highly restricted micro sites." ↑ "IBA: Greater Blue Mountains". Birdata. Birds Australia. Retrieved 2011-06-29. Gundungurra Blue Mountains Aboriginal traditional owners. This page was last changed on 5 April 2019, at 15:43.